When setting up a gadget for review, delicately unboxing and smelling the carcinogenic whiff of freshly molded plastics, we typically feel some amount of excitement and anticipation to see how it stacks up against the competition. It's either that or a resigned sense of duty as we run yet another iterative evolution of this or that laptop through the same benchmarks to see just how this year's model stacks up to the older model now being sold on discount. 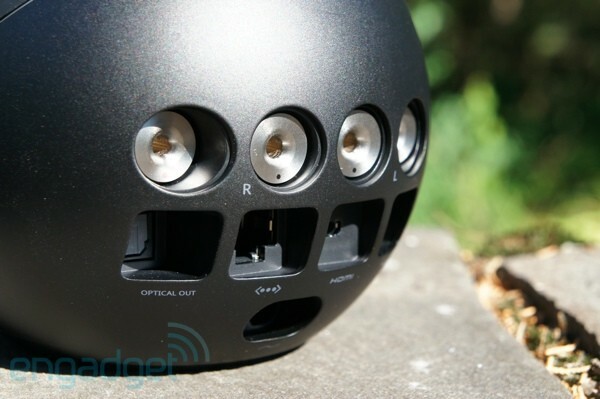 With the Nexus Q, though, we felt something different altogether: genuine curiosity. Why? Well, it's a high-end device with a $299 MSRP, a price that's multiple times higher higher than media streamers like the Apple TV, anything from Roku and, indeed, Google's own Google TV. And yet, the Q has considerably less functionality than any of them. Largely because of this, many who witnessed its unveiling at Google I/O were quick to write it off. Despite having our own doubts we pledged to give it a fair swing, a week of solid use at home and with friends. How did it do? Does this high-concept device with high-end componentry make up for some decidedly low-end capabilities? There's only one way to find out. Google's curious little media streamer is a beauty to behold but offers an unfortunate combination of high price and limited functionality. 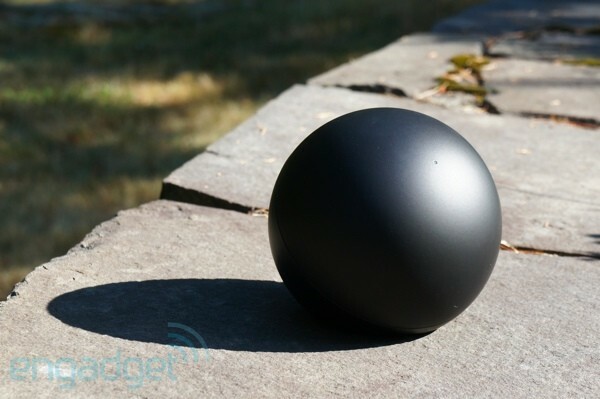 How would you rate the Nexus Q? If you've ever been candlepin bowling then you know what it's like to cradle a Nexus Q in your hands. Coincidentally (or, perhaps, intentionally) the Q fills almost the exact same dimensions as one of those kid-sized rolling implements, weighing in at two pounds (923g) in weight and measuring 4.6 inches (116mm) in diameter. Yes, diameter. It's not too often we get to use such dimensional terminology when measuring things we review, but here we can as the Q is an almost perfect sphere. Its symmetry is betrayed only by a slight flat spot on the bottom, useful to keep it from rolling its way across your entertainment center, and by the selection of ports poking out the back. Those sockets are reasonably comprehensive, including micro-HDMI, micro-USB, TOSLINK, 10/100 Ethernet and, most importantly (and, perhaps, controversially) powered stereo outputs just waiting to accept your overpriced, low-impedance speaker wire. Powering those outputs is an internal 25-watt amplifier, custom built to work in harmony with the custom power supply also nestled within this near-sphere. Why are these controversial? Powering those outputs is an internal 25-watt amplifier, custom-built to work in harmony with the custom power supply also nestled within this near-sphere. That's no mean feat of engineering and it's surely responsible for a good chunk of the Q's high cost. That, we think, will be a problem for people who simply want to use the HDMI or TOSLINK output to get a clean digital signal out to their home entertainment center -- thus bypassing that amp altogether. Also inside is a trio of wireless connectivity options: Bluetooth, NFC and dual-band 802.11a/b/g/n. The NFC and Bluetooth are used for pairing with other Android devices, while the WiFi and Ethernet come in for the sucking of content down from the cloud. Some of it will be buffered to the 16GB of internal flash, but you don't have direct access to any of that storage for storing content. There's also a dual-core TI OMAP processor inside, the same as the one found in the Galaxy Nexus. The Nexus Q exterior is bisected by a ring of LEDs, 32 in total, each of the RGB variety and designed to dance together, providing a Technicolor representation of whatever groove you've channeled through. It's this ring that separates the metal bottom of the device from the plastic top, which spins freely and is a single, large capacitive touch section. Spinning the top acts as a volume dial and tapping serves to mute whatever's being played. Very limited controls -- but then you're meant to rely on your phone or tablet for everything else, as we'll get into below. Though the top is made of plastic it was given some internal metal weighting in an attempt to impart a higher-quality feel, and while that plan was mostly a success, the upper piece definitely feels more hollow than the bottom portion. That part is all metal, which adds weight to keep the contraption from toppling off your bookshelf and also acts as an integrated heat sink. That, as it turns out, is an important thing, as the Nexus Q gets quite warm whilst pumping out your hottest jams. The Nexus Q's initial setup is incredibly easy -- trivial, even. Just run the skinny, two-prong power cable to the wall (no power brick here) and connect your favorite pair of bookshelf speakers. Google recommends a pair of Triad speakers, but as we didn't have any for testing we went with a few pairs lying around: some old Advents and a couple of slightly more modern (and rather more petite) Klipsch Quintets. Bookshelf speakers all, the sort we think people would be most likely to hook up here. We plugged the combination into the wall, leaving us with a dimly glowing, ominous-looking and completely silent ball that can't do a damned thing. You'll need some banana plugs to make your connections, as the Q has no exposed posts and no way to accept raw speaker wire. So, we stripped some clean 16-gauge wire, threaded on four fresh connectors, popped them in the back of the Nexus Q and plugged the combination into the wall leaving us with a dimly glowing, ominous-looking and completely silent ball that can't do a damned thing. Not without a little external help, that is. 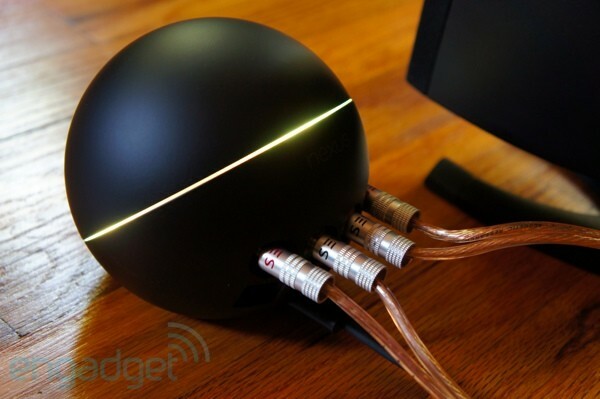 To actually do something you'll need a device that can run the bespoke Nexus Q app, which advertises itself as being compatible with "any Android phone or tablet running Android 2.3 (Gingerbread) or later." That is, sadly, a terrible lie. The app exclusively works on Jelly Bean devices and, while we're told that will change before the Q ships later this month, for now the things that can actually control the Q are very few. Thankfully, we had not one, but two compatible devices on-hand: the new Nexus 7 and a recently upgraded Galaxy Nexus. Tapping the 7 on top of the sphere brought up the Q application in the Google Play store and, a few moments later, we had it installed. To pair with the Q, the app must use Bluetooth -- but only for a few moments. After that, all communication with the device goes all the way out into the cloud and back again, meaning you can control it even if you're well, well out of Bluetooth range. At this point you're ready to play, but there are some further options the Q owner can configure. Maybe. As it turns out, a bug in the Q has it currently showing up as owned by someone other than the actual owner. Who that someone is we're not sure, but the net result is that, after the Q is configured, it will quickly shun your ownership and lock you out from its more juicy configuration options. The only way to restore that highly transient feeling of possession is to do a complete factory reset on the Q. That works -- for a little while. You can specify in which room your Q resides, so that you can easily push tunes to your bedroom, living room, media room and more. Once reset, you have a world of options at your disposal, including managing the brightness of your Q's blinkenlights (or shutting them off entirely), calibrating the audio delay on the digital outputs and locking their volume levels. You can also specify in which room your Q resides, so that you can easily push tunes to your bedroom, living room, media room and more -- in the honestly unlikely case that someone should choose to invest in more than one. Our first test of the Q was with friends, friends who happen to own Android devices. The goal was to re-create this social streaming situation that we were shown during the Google I/O keynote -- namely, people queuing up their favorite tunes and most hilarious YouTube clips. That experiment turned out to be rather less exciting when we learned that re-creating this situation was impossible. The app, of course, is wholly incompatible with their non-Jelly Bean devices. Again, that'll be fixed soon, but it definitely didn't help the party get started here. Thankfully we had both a Galaxy Nexus and Nexus 7 running Jelly Bean, so we were able to at least make an effort at creating a party around the Q. But, presented with an unfamiliar library of tunes in Google Music, our companions quickly turned to the rather more palatable task of selecting YouTube highlights. Yes, the honey badger made an appearance. Playing YouTube videos on the Q is as easy as tapping an icon on the top of the app with a play button showing some waves coming off, toggling external playback, then playing any video you like. The problem is you can't create a queue of videos; if another gets tapped it then fires up and is soon playing on your TV. Whereas with music, multiple people can work together to build out a killer playlist. However with YouTube, the current video gets replaced as soon as a single person gets the slightest bit impatient. And, really, that's about all there is to it. You can play media through the Google Play media apps (music and videos) and push YouTube videos to the Q. Nothing more. Have a library full of ripped music or MP3s purchased from some other store? You'll need to upload all of it to Google's servers for it to be playable here. Same goes for videos. Your complete collection of downloaded Engadget Show episodes cannot be played here. Any video you want to play through the Q has to be rented or purchased through Google Play. That's a shame, as this could have gone a long way toward fixing the annoying lack of output on the Nexus 7 tablet. There's no option for lossless playback. There's no DLNA support, no support for playing media from external storage and no way to fill that 16GB of flash with music. Sure, the focus is definitely on audio, but even music playback lacks features. That amplifier puts out some very clean sound when paired with non-powered speakers, but this is the kind of setup intended for audiophiles looking for a simple secondary system -- exactly the kind of listener who cringes at the thought of lossy, compressed streaming audio. There's no option for lossless playback. There's no DLNA support, no support for playing media from external storage and no way to fill that 16GB of flash with music. And, to top it all off, there's no configurable equalizer. If you can live with all those missing pieces you'll get some very nice sound from such a petite system. The Nexus Q has a remarkably small footprint, a footprint we'd have been willing to extend a bit in exchange for a few more physical controls. As it is, we quickly got tired of reaching for our tablet to pause the music. The Nexus Q is begging for some sort of web-based interface. In fact we quickly tired of reaching for our tablet in general. The Nexus Q is begging for some sort of web-based interface. Google Voice showed us how wonderful listening to voicemail and sending texts from a web browser can be, so why do we have to keep turning away from our keyboards and unlocking our mobile devices whenever we want to skip a particularly annoying track. Even an IR port somewhere in there for compatibility with universal remotes would have been a nice bonus. And then there are the lights. The 32 RGB LEDs scattered about the rim and the 33rd punctuating the top of the device put on quite a handy little light show when your tunes start dropping beats, or get a bit more mellow when the tracks get a little more chill. They're impressively bright and, while opinions are bound to be hugely divided on this subject, we like them. Yes, they can be distracting, but if we're talking about something that's intended to liven up a party, a chromatic cavalcade swirling around your entertainment center won't hurt. And, yes, you can turn them off if you'd rather. After a week with the Q we're honestly still of mixed mind about the thing. On one hand it's a sophisticated, beautiful device with such a fine-grained degree of engineering you can't help but respect it. It feels like a mysterious piece of alien technology that's beamed straight down to your bookshelf. It also feels like alien technology in that we have no idea what to do with the thing. Sure, it can stream music or movies, but we have dozens of other ways of doing that already, and nearly all of them offer plenty more functionality. Even the $99 Apple TV is hugely more flexible than this Android-powered device, and that's a curious state of affairs. The Nexus Q is an impressive piece of hardware that, given time and a serious augmentation of capability, could mature into a very exciting little thing. Right now, though, the Q feels like a high-priced novelty. A very nice novelty, but a novelty nevertheless.